Call 828-385-4571 to schedule your first appointment. If you'd like to improve your quality of life by enhancing your communication abilities, meet with the hearing care specialists at Miracle-Ear®. As one of more than 1300 locations across the country, our independently owned and operated center proudly serves customers seeking hearing aids in Marion, NC. Plus, Miracle-Ear is America's most recognized brand of hearing aids. Our products are comfortable, discreet, and made with state-of-the-art components. Our hearing aid with GENIUS™ Technology is especially designed to reduce background noises. When you move to another acoustical setting, our device will make the minor adjustments essential for acoustic fidelity. Our hearing care specialists will discuss the approach and products that may be best for your situation. We're dedicated to our customers, so we offer ongoing services. You can depend on us for assistance with hearing aid repairs and any minor adjustments that may be needed to maintain your hearing perception at its peak. If you'd like to discover and experience the Miracle-Ear advantage, we're only a call away. For your appointment with a full-service Miracle-Ear hearing center in Marion, contact us today. 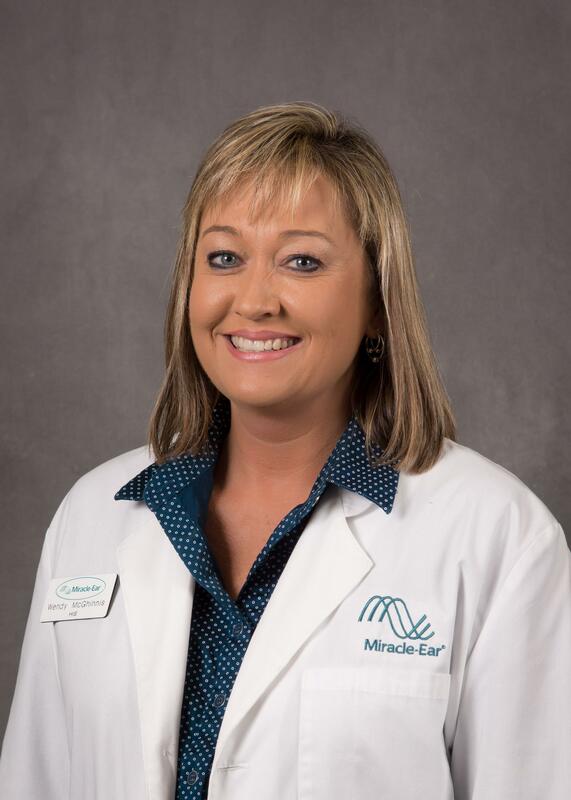 In 2012, Wendy joined the Miracle-Ear family and began her career as a Hearing Healthcare Professional. As a member of the International Hearing Society and a Miracle-Ear nationally Certified Hearing Care Professional, Wendy takes great pride in having the knowledge, skills, and ability to customize solutions for each of her patients with their need for better hearing. She has received multiple certifications in the areas of Health, Science, and Insurance. After graduating from school, Wendy's goal was to pursue a career where she would enjoy her profession and truly have a positive impact on people's lives. There are few careers that offer that opportunity, but none fit Wendy more than the role of a Hearing Healthcare Professional. She loves to go to work every day and see how better hearing changes the lives and well-being of her patients. Wendy has lived in North Carolina her entire life. Being close to her family is very important to her. Wendy's father, mother, and sister are all here with her in the Morganton and Lenoir area. She is proud to be the mother of a wonderful young man who enjoys the Carolina Mountains as much as she does. In her free time, Wendy enjoys being outdoors, camping, hiking, and spending time with her family, friends and her dog.